At least 7 civilians were killed and 16 others wounded as the eastern Ukrainian city of Kramatorsk was shelled on Tuesday, according to local authorities. 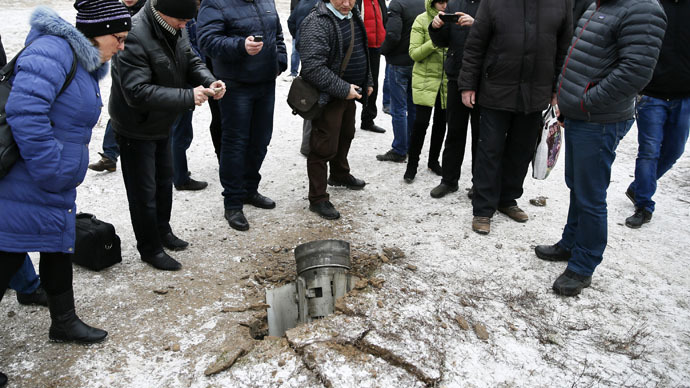 “As a result of today's shelling of Kramatorsk… seven civilians were killed and another 16, including two children, received injuries of varying degrees of severity,” the Donetsk Regional State Administration said. According to the administration, the shelling was carried out by Grad multiple rocket launchers and came from the direction of the town of Gorlovka, southeast of Kramatorsk. Ten Ukrainian servicemen, who were stationed at Kramatorsk, were also injured in the bombardment, it added. It was not immediately clear who was responsible for the bombardment, which took place at 12:30 pm local time, with Kiev forces and the militias putting the blame for the incident on each other. “There were no strikes by us from any kind of weapon in the direction of Kramatorsk,” militia representatives told RIA Novosti. Meanwhile, Ukrainian President Petro Poroshenko said that the headquarters of Kiev’s military operation in the southeast was targeted. “The strike was aimed at the military headquarters, but the second round of fire hit the residential areas of Kramatorsk,” Poroshenko said. Kiev also announced that its forces have started an offensive against the rebels near the port of Mariupol. “The counter offensive against the militias is under way. Now our forces are returning to the line of demarcation, to their positions, drawn by the Minsk agreements [of September 5, 2014],” Andrey Lysenko, Kiev’s military spokesman, was cited as saying by Interfax-Ukraine news agency. The intensification of military action by both Kiev and the rebels comes just ahead of the Normandy Four peace talks, which are scheduled for Wednesday. The leaders of Russia, Ukraine, Germany and France hope their meeting in Minsk may return Kiev and the militias to the negotiation table. A source familiar with the agenda of the Normandy Four talks told RIA-Novosti that rebels have assured Moscow that they’ll abide by a ceasefire if Ukraine orders its troops to do the same. The Minsk talks on Wednesday are “another huge chance…to take a big first step towards de-escalation” in southeastern Ukraine, German Foreign Minister Frank-Walter Steinmeier said. "But nothing has been resolved yet. The taking place of the summit alone is no guarantee of its success. I urge and expect Moscow and Kiev...to really seize this chance," Steinmeier said, as quoted by Reuters. Kiev and rebels previously signed a peace deal last September, but the truce failed to hold, being violated by both sides on a daily basis. Large-scale warfare resumed in eastern Ukraine shortly after the New Year as Kiev launched a massive assault on the militia’s positions, provoking a counteroffensive. The Ukraine conflict began last April, when Kiev sent regular forces and volunteer battalions to the southeastern Donetsk and Lugansk Regions, after rebels there refused to recognize the country’s new, coup-imposed authorities. The civil war has so far claimed the lives of at least 5,300 people, according to the UN estimates.